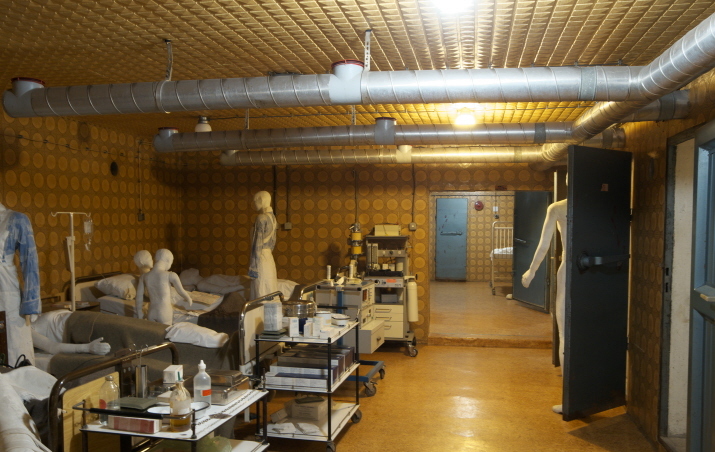 A reconstruction of the basement rooms of the hospital in Vukovar, Croatia, where several hundred people sought refuge during the Battle of Vukovar in 1991. It was from here that the victims of the Ovčara massacre were taken. This memorial space, at an authentic location, is not especially informative but incredibly visual and in that way quite impressive. More background info: For general background about the war context see under Croatia and Vukovar, and about the fate of the people taken from these hospital basement rooms see under Ovčara. The hospital (Croatian: “Bolnica”) of Vukovar was a natural place to try and seek safety in as the Battle of Vukovar raged on. And many people who hadn't had a chance to flee (or didn't, yet, want to) did go there. Of course, the hospital was also the place where people wounded in the fighting would be taken to. Yet the hospital was not immune from being hit by shells and bombs, even though according to the Geneva Convention all warring parties are obliged to avoid targeting such places as schools and hospitals. 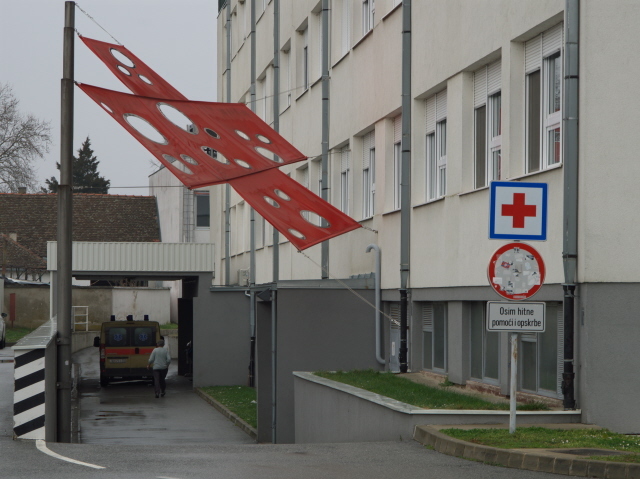 One bomb dropped on the hospital by an Yugoslav Air Force jet in October 1991, smashed all the way through the floors above the basement and almost tore a hole in the ceiling there. As the higher floors had evidently become unsafe, staff and patients were moved to the basement. Here they were joined by civilians seeking refuge in the final stages of the battle before the Croatian surrender on 18 November 1991. But instead of being granted an evacuation and safe passage, the remaining occupants of the hospital cellar, patients, staff, civilian refugees, were captured and most of them later taken to Ovčara and handed over to the Serbian paramilitaries. And that's where the Ovčara Massacre, also known as the Vukovar Hospital Massacre or simply Vukovar Massacre happened – see under Ovčara. The hospital was rebuilt after the war, and part of the basement was later recreated to give an impression of the conditions under which the hospital staff and the people seeking refuge here lived during the siege of Vukovar before their capture by the Serbs. It is run as a branch of the Memorial Centre of Homeland War and its official title in Croatian is: “Mjesto sjećanja - Vukovarska bolnica”. What there is to see: Once you've found the entrance (see below), note that this already has a reconstruction of sandbags and wooden planks, as were used to secure doors and windows during the battle, right next to the entrance door with the site's symbol – which is a kind of stylized red cross with several big holes in it (not too difficult to decipher the meaning of that). A big sculpture of that symbol also hovers above the entrance. Be aware that this is a working hospital, so you may see ambulances deliver patients as you head for the basement entrance. And of course regular hospital staff in typical white attire are encountered everywhere. Once inside you proceed down a corridor and come to a reconstruction of an operating theatre. Note that the window behind it is covered by an image of a stack of yet more sandbags. Turn right and further down into the bowels of the hospital, and past nurses and other staff carting trolleys and whatnot back and forth, and you finally come to the actual memorial rooms. The corridor that these branch off from is almost bare, except for a single white mannequin standing forlornly by a radiator. On the walls are a few framed photos and on the tiled lower part of one of the walls the names of the victims of the Ovčara Massacre are given on black tiles. On another section the white tiles bear short explanatory texts and what seems to be a timeline, but it's all in Croatian only. 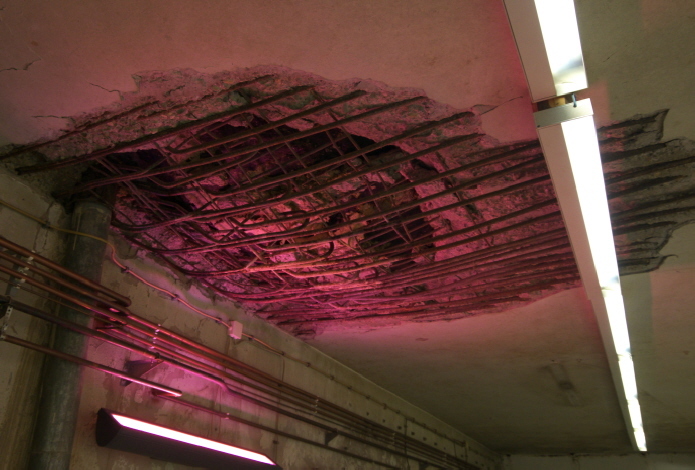 One part of the ceiling is illuminated by LED lights of constantly changing colours (as has become so common) to dramatize the damage the ceiling sustained here from a bomb dropped on the hospital by the Yugoslav Air Force (see above), which almost crashed through all the way to the basement. To the side of the corridor, through heavy steel doors, you enter the actual reconstructed rooms. These are populated with dozens more of those eerie white dummies. Hospital staff dummies are wearing typical nursing attire, all others are plain white. This makes them look rather spooky, like zombie mummies that have been frozen in mid-movement. Some are lying in hospital beds, others are standing next to these or in doorways or are sitting on chairs. There are child dummies as well – and even a hobby horse and a teddy bear that are also as white as if 100% in plaster, just like the humans. It's visually quite stunning and more than just a tad nightmarishly creepy. 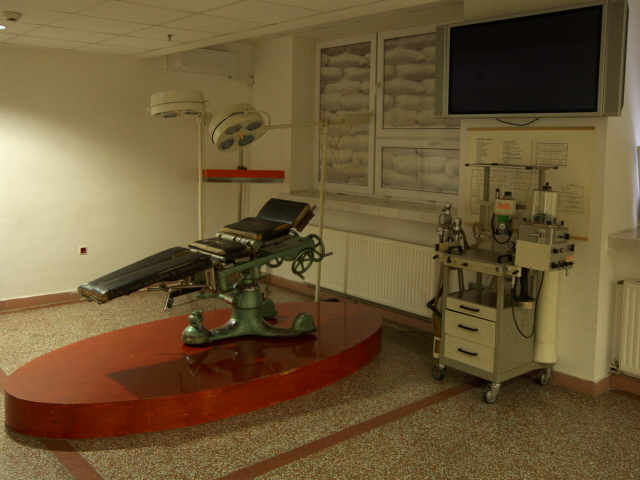 The rooms are furnished with all sorts of hospital props – various machines, medicines, surgical instruments and such like. One side room seems to be the pharmacy (with meds stacked on shelves), another appears to be a kitchen. One room is full of large tanks for either heating fuel or maybe drinking water. There's a toilet too (with another white mummy-zombie just emerging) and in one of the small side rooms bedding has been made straight on the floor, presumably to illustrate how the hospital ran out of proper beds. That seems plausible because one of the other larger rooms is crammed full of three-tier bunk beds for a few dozen patients lying in them, while some others have to stand in between the rows of beds. 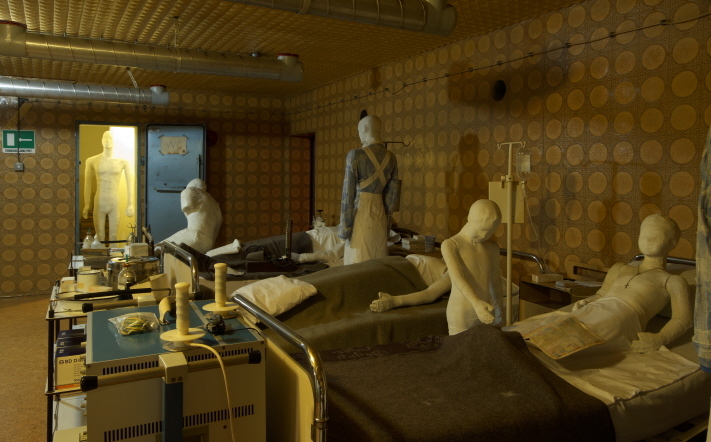 An especially moving room is the reconstruction of the makeshift obstetrics ward in the basement. This is less crammed full of people (well, white dummies). But it has an incubator – complete with a mummy-white dummy premature baby, while a small bed nearby has white dummy baby triplets. Two other cots contain just regular single babies. In the proper full-size hospital beds are a couple of more or less heavily pregnant dummy mothers-to-be (or ones just having become mothers – though it is odd that even the still heavily bulging women have cots with babies at the feet of their beds ...). On a more serious and sombre note, there is one room that is non-representational but rather is a pure remembrance hall. There's a perspex glass cube in the centre that emits red light from the inside and has an electric candle standing on top, all of which is reflected in the room's warped mirror walls. It's a bit like a sombre house of mirrors. Finally there's a narrow corridor that leads past some ventilation equipment and eventually ends at a staircase leading up, but which is blocked at the top. Likewise there's a ladder leading, presumably, to an escape hatch, but there is no escape here. You have to go back. In this final section hidden speakers play some loud background sounds (with lots of distant shouting and noise) – which is probably why the place is described as a “multimedia presentation” on the local tourist info website and the homepage of the Memorial Centre. Location: to the north of the centre of Vukovar, by the road leading towards/coming from the harbour and Borovo. Access and costs: The entrance may be a little tricky to find, unless you use the rear gate; inexpensive. Details: The memorial rooms are in the basement of the actual, working hospital (Croatian: “Bolnica”) of Vukovar. The main entrance to the hospital is on Županijska ul., from where you'd have to make your way all around to the back of the central building. It's easier to find from the hospital's rear gate on Ul. Ivana Gundulića, from where you can already see that large stylized red cross symbol of the memorial over the entrance to the basement. There are a few parking spaces just outside the gate. 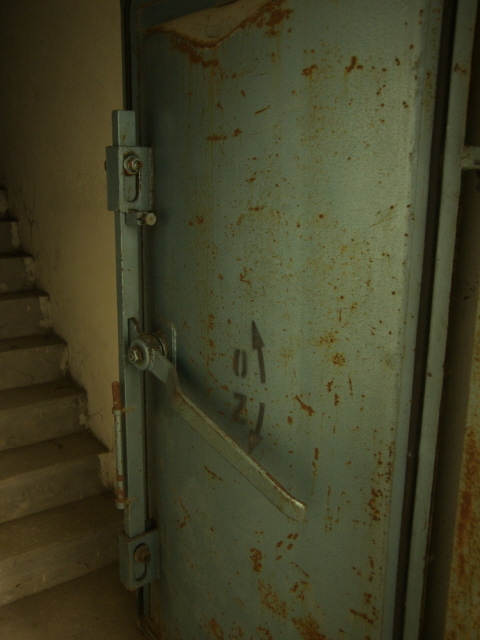 The red cross symbol with holes in it is also marked on the door to the basement. So it is the correct spot, though you might hesitate. This is a working hospital, with nurses and ambulances and support staff etc. busying themselves all around. But don't let that deter you. You are allowed to go in. Inside you first have to find the office of the memorial (which also has some souvenir items for sale) to pay your admission fee. Admission: 15 HRK for adults, 7 HRK for students and seniors. Opening times: Monday to Friday 8 a.m. to 3 p.m., at weekends only for groups by prior appointment. The website says “ticket price with professional guide”, but I'm not sure if that only applies to groups. No other visitors I saw, couples and small private groups (but not school classes), seemed to be with a guide. And when I was there, there was a woman in the office who spoke only the most rudimentary, broken English, but managed to communicate to us that her boss, who normally takes the payments (and maybe arranges guide tours? ), wasn't there, but that she herself was not authorized to take any money – and so she let us in free of charge. Time required: ca. half an hour or so. The site most associated with the Vukovar Hospital Massacre is of course Ovčara – but that is on the outskirts of the other side of town (without traffic the drive takes about 15 minutes, but the centre of town is often clogged up with traffic, which can slow things down significantly). It's a shorter distance to the northern suburb of Borovo with its largely abandoned shoe factory – and en route you pass the atmospheric ruin of the former train station (see under Vukovar).